On my trip up to Sydney a few weeks ago I finally visited Momofuku Seiōbo, the much-ballyhooed restaurant from US/Korean chef, Lucky Peach co-editor and gastrohipster cultural icon David Chang. 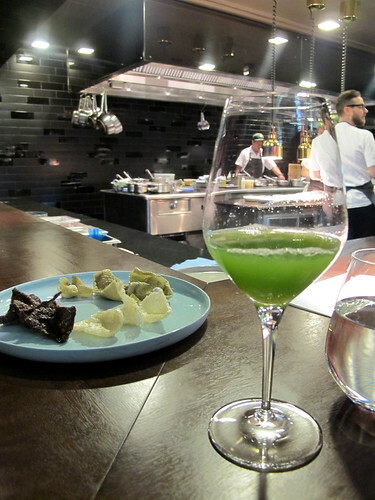 And as hesitant as I am to add my voice to the fawning cheersquad, it really was an exhilarating dining experience: food that was fun and intelligent without being cerebral, served in a polished but unstuffy environment with a killer soundtrack. Chang may spend most of his time back in New York, but he leaves the Seiōbo kitchen in the clever, capable hands of chef Ben Greeno and his team. Rather than the $175 a head dinner we went for the $100 a head lunch, which proved to be fantastic value for money. 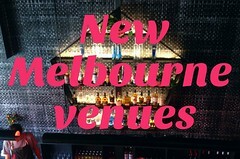 We navigated the online reservation system and were able to get a booking for four with a minimum of fuss, but when one of our party had to pull out at the last minute, the lovely Lee Tran Lam from Sydney blog The Unbearable Lightness of Being Hungry graciously stepped in and took her place. LTL's vegetarianism gave us the advantage of seeing other dishes in addition to the ones served to us omnivores (photos of the vegetarian dishes at the end of this post). 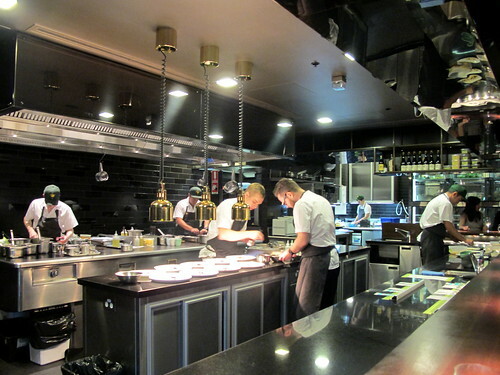 The four of us were stoked to be seated in prime position along the corner of the bar, with a great view of the kitchen team preparing our dishes. 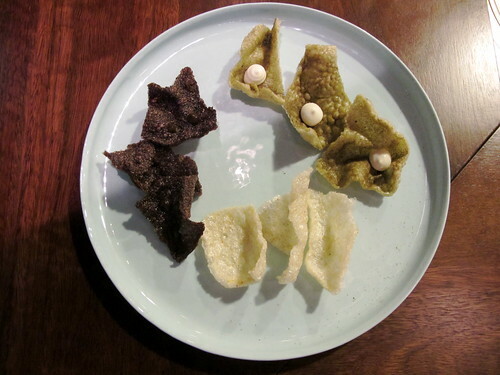 The tasty snacks to begin with were blood crackers, chicharrónes (fried pork rinds) and nori chips. The chips were followed by the inevitable Momofuku pork bun. 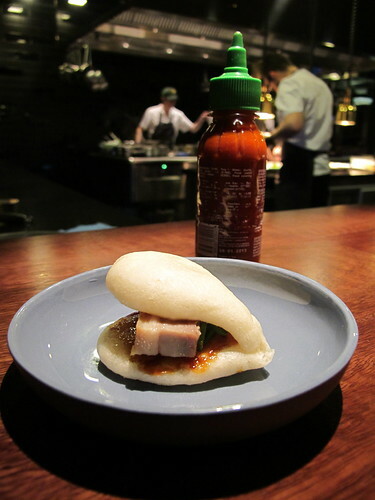 Originally an eleventh-hour addition to the Momofuku menu, the fluffy steamed bun filled with pork belly, hoisin and cucumber took New York by storm and became David Chang's signature dish, whether he wanted it to or not. For months before Seiōbo opened Chang claimed that the bun wouldn't be on the Sydney menu, and yet here we are. And yes, it's sinfully delicious (just as good as when I first tried it in New York at Momofuku Ssäm three years ago). Best enjoyed with a little hit of Sriracha sauce. 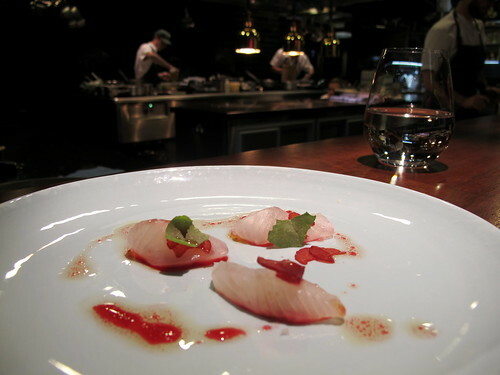 The sashimi course was striped trumpeter, paired with rhubarb and a few torn corners of salt bush. The delicate flavours suffered from arriving hard on the heels of the fatty fireworks of the pork buns. 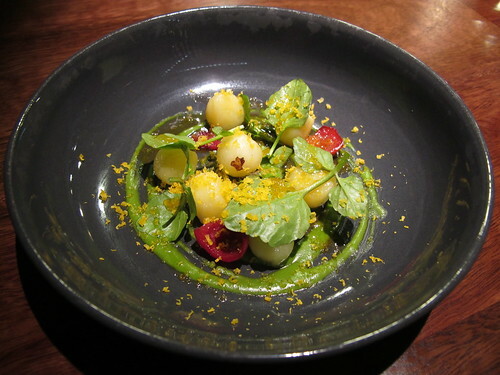 Next came a plate of baby confit potato with watercress, segments of quandong and dainty shavings of yolk. While pretty, it was probably the least memorable of the dishes we were served - perfectly pleasant but eclipsed by the other dishes. 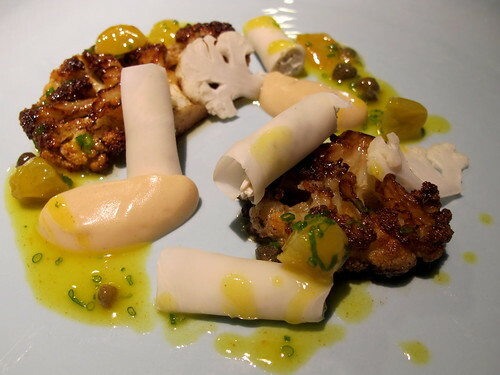 Do you ever come across a dish you just want to wrap your hands around and embrace? 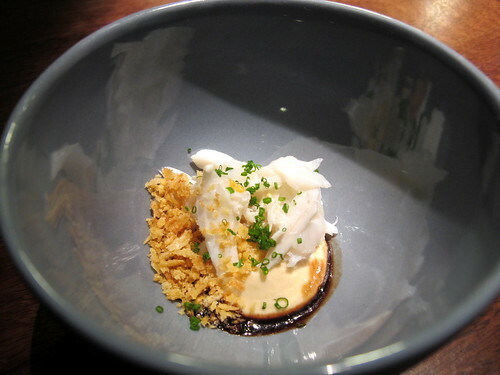 That's how I felt about the tender, juicy shreds of crab with warm miso cream and crunchy panko crumbs. This was my favourite course, the highlight among highlights. 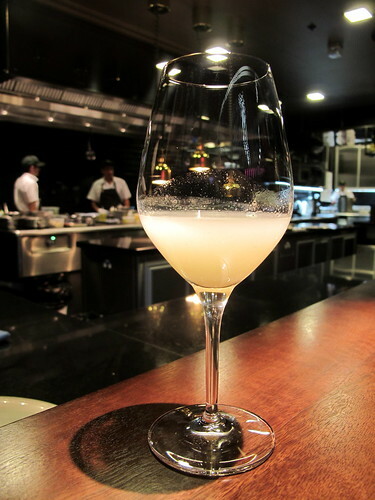 The pasta course was pea agnolottini in a buttery sauce, sprinkled with small cubes of jicama and microscopic cubes of Serrano ham, and topped by a squirt of cold Parmesan foam dispensed from a soda siphon before our eyes. 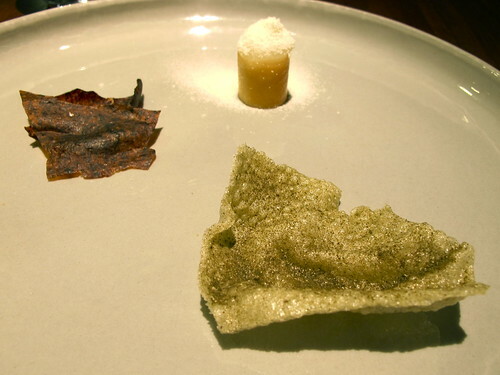 The word "foam" fast became a dirty word back when so many chefs jumped onto the molecular bandwagon, but this was a good example of how the technique can still be used to impressive effect. 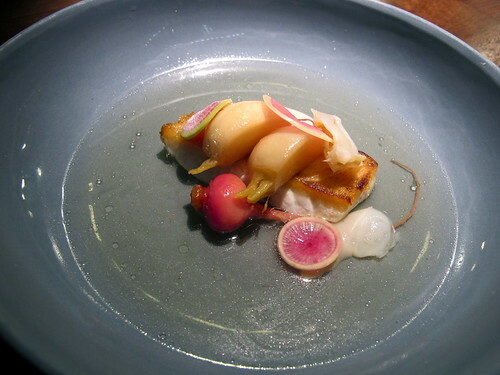 The mulloway fillet, crisped golden brown on one side, was another highlight, served with technicolour pickled turnips and a refined eel dashi. At this stage in the meal we'd just remarked to each other that it hadn't been a particularly meaty meal, and were forced to eat our premature words when the next course came out (though the scimitar-like knives placed before each meat eater should've tipped us off). 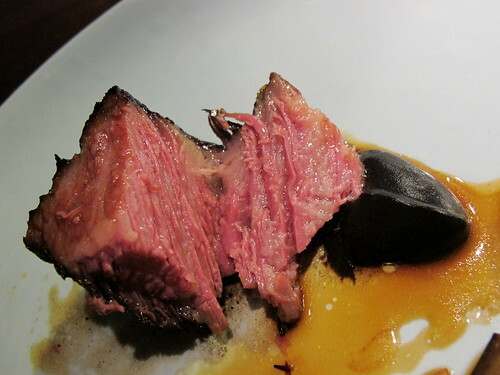 The shortrib had been slow cooked until its obscene ribbons of fat had dissolved (see the cross-section photo! ), then had been seared to give it a lovely black crust. 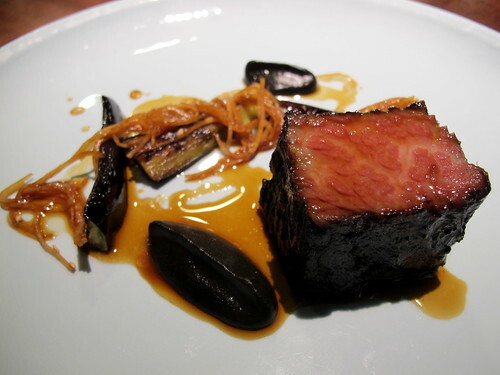 It was matched with burnt eggplant and strands of pickled kohlrabi. The blast of Metallica that suddenly boomed over the restaurant speakers as we took our first bite seemed somehow apt. 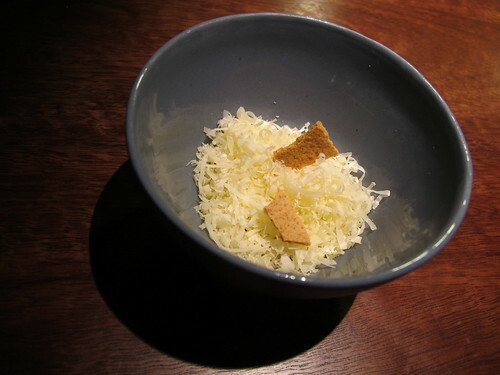 Next was a cheese course - shredded C2 cheese with spelt crackers, to be precise. C2 is a hard, cooked-curd cheese from Tasmania's Bruny Island Cheese Co, made from cow's milk and currently the only nationally available unpasteurised cheese made in Australia (read more about it in John Lethlean's recent article). Picking our way through it with a teaspoon, we were delighted to find little nuggets of crab apple jelly hidden inside, providing a sweet counterpoint to the nuttiness of the cheese. 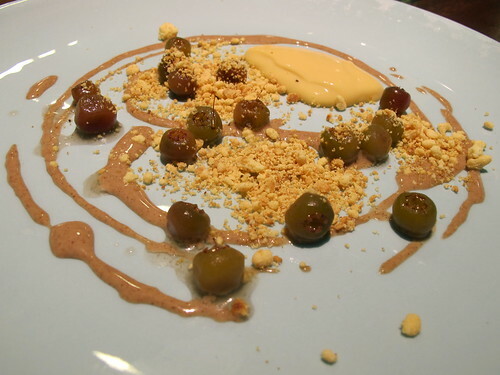 The sweet dessert was a relatively simple affair consisting of honey, muntries and hazelnut. 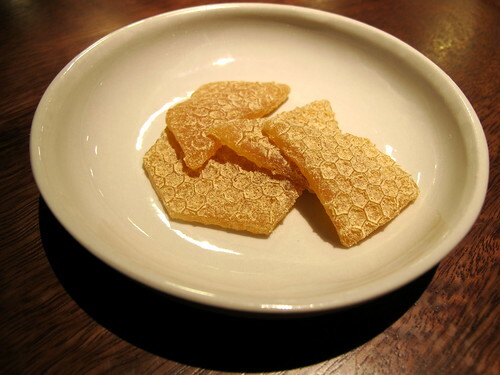 And to finish off, pieces of honey liquorice, stamped with honeycomb-like hexagons and dusted with bee pollen. 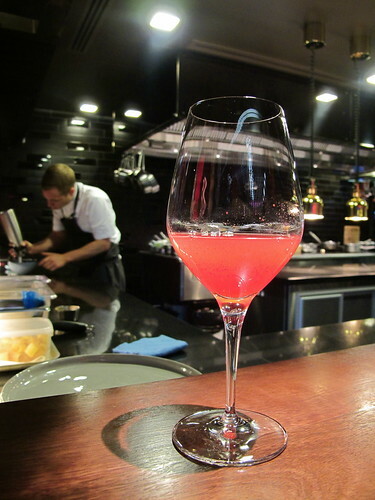 Because I was nursing an epic hangover - my friends in Sydney are all boozehounds - I skipped the optional alcohol pairing ($60 with lunch) in favour of the optional juice pairing ($30 with lunch) and really enjoyed it. The juices included cucumber, watermelon, mandarin, red currant and my favourite, apple and parsnip (which tasted like a Sunday roast in liquid form, only more zingy and refreshing). My boozehound friends who went with the alcohol pairing were impressed with the wines and sake they were served. 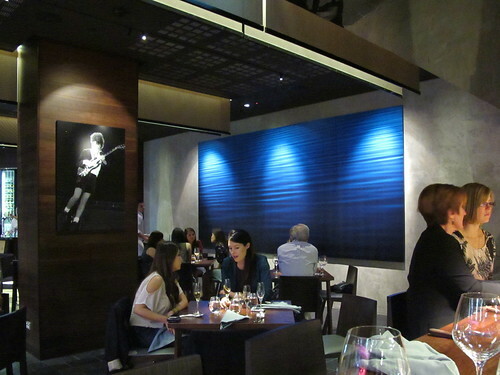 Most of the action at Seiōbo is up at the bar, but there are also a handful of separate tables alongside a poster of AC/DC's Angus Young. 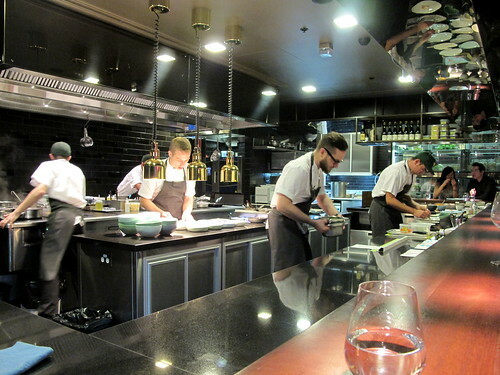 Service was unfailingly professional and thoroughly informed - but I couldn't help feeling the green caps worn by some of the chefs as part of the kitchen uniform were a little naff. And briefly, here are the vegetarian alternatives Lee Tran ate. 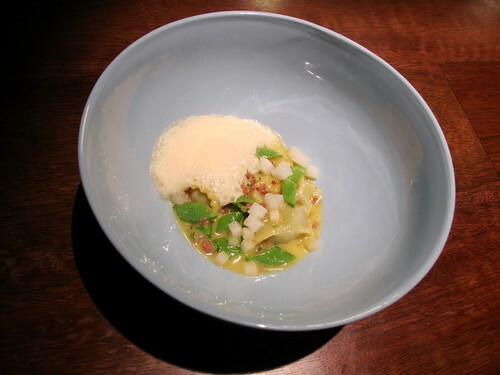 Some of the dishes were the same: the potato/quandong, the agnolotti (minus Serrano ham), the C2, the muntries, the liquorice. Alongside the nori chip LTL had a stub of smoked potato and a shitake chip with such an amazing intensity of flavour that she insisted I try it (very kind of her!). Her steamed bun came with shitake instead of pork belly. 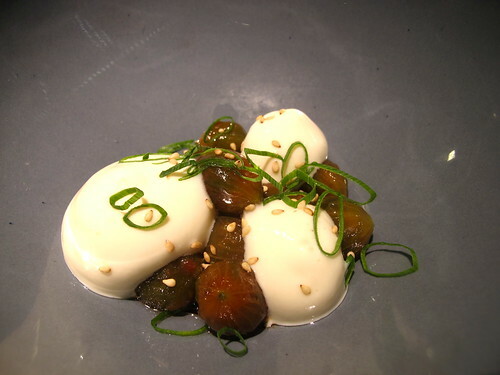 Tomato, dollops of yuzu and sesame. LTL was in raptures. 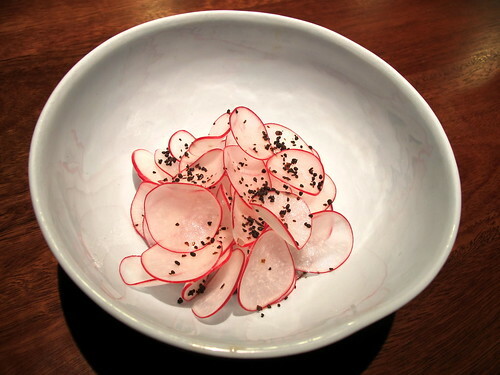 An amazing dish of burnt watermelon with fermented black bean, covered by thin discs of radish and watermelon 'ash' (a variant of this is served with wagyu beef as part of the dinner menu, I believe). 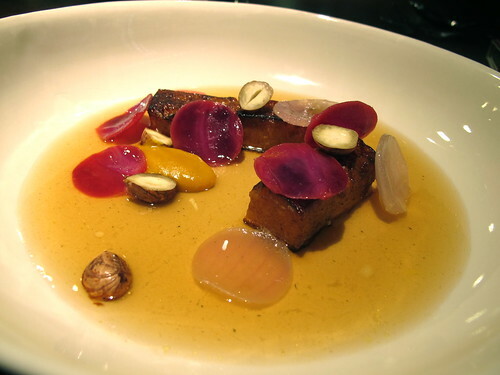 Smoked squash, cabbage and hazelnut with a roasted pumpkin broth. 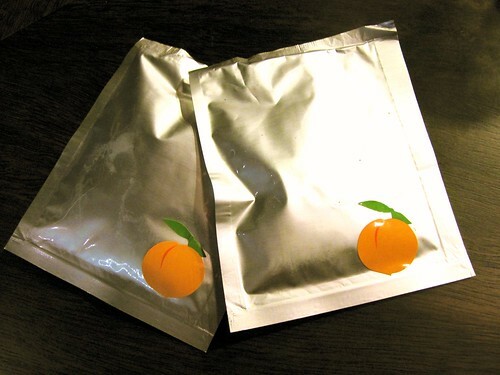 And at the end of the meal, all four of us were each given a packet of Momofuku kimchi to take home. 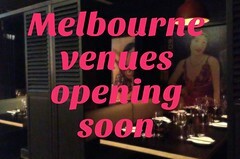 To conclude: make sure an advance visit to the Momofuku Seiōbo online booking system forms part of the planning for your next Sydney trip! Lovely post! 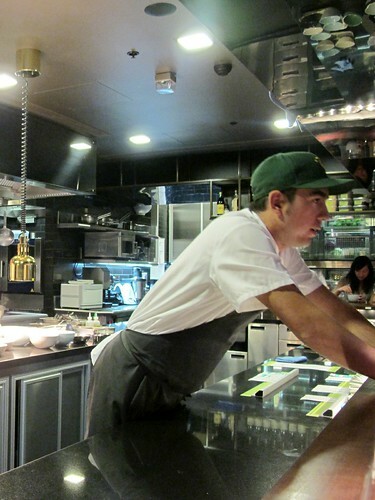 I've heard so much hype about the new Momofuku, but hadn't actually seen any pictures or heard any first-hand experiences yet, so was happy to see your post - thank-you for sharing! The crab looks absolutely amazing, in-fact, everything looks pretty good. A lovely dissection of your meal. The photos are stunning. I was trying to convince myself Momofuku was over hyped and I did not NEED to go for my Sydney trip - I think you have convinced me otherwise. I tried tonight to add a comment to your post. Unfortunately the process is now even more difficult than before - and it was difficult before, believe me, unless you did it every day - so I have given up after 4 attempts. Life is too short. What a fantastic looking meal! 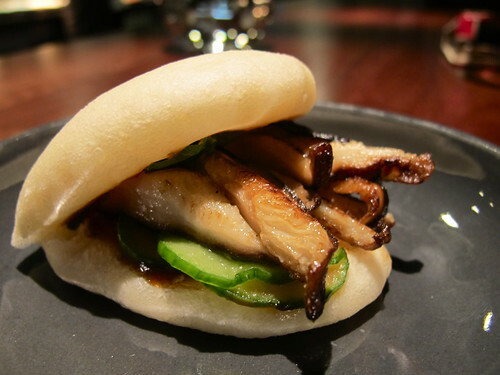 I remember having the pork buns at the Momofuku Milk Bar in NY and my mouth is watering all over again! The juice pairing sounds delightful as well, your juices are so colourful! 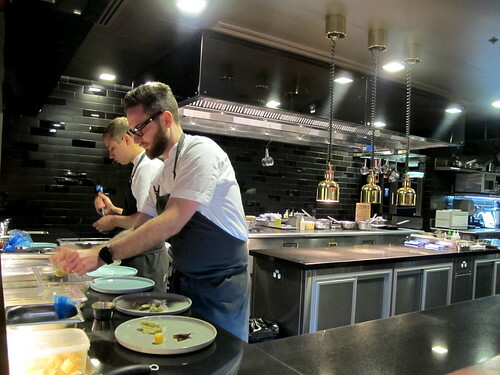 I still haven't been won over by the idea of the $175 tasting menu ... i'd much rather pay for individual courses and eat the amount that i actually want to eat. However, your post is extremely enticing. And there is no other option!! !